The fourth book for Michael Daley and Rosie Fernandez. They're back after a year teaching on the other side of the bay. Refreshed, they're ready to work in law again, with Rosie doing better. However they get a call from the past. 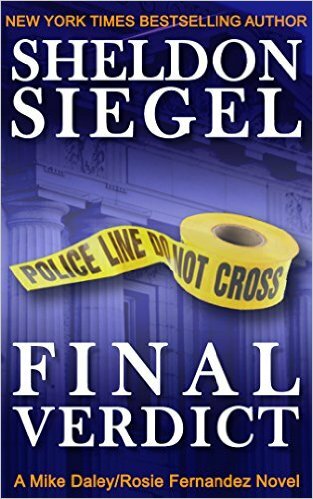 Final Verdict is the story of a man that was arrested as an accomplish as a college basketball player. His brother killed a man and he drove the car, always telling Rose and Michael (then public defenders) that he was innocent. He's dying and was arrested again, supposedly killing a white VC in one of the seedier parts of the Mission. It's an interesting story. We rarely see the defendent, but the story races. The accused is dying of a liver issue. He's unlikely to live more than a month or two, so Michael pushes ahead for a preliminary hearing in two days and mounts his defense there. The original case likely ruined the Daley/Fernandez marriage, and also got them suspended. They're torn, but they also feel some obligation here. We have another story where everything appears to be going one way and then switches back. Better than the third book, and it has the two lawyers swearing off murder cases at the end. Also, another amazing surprise at the end. This one is good.